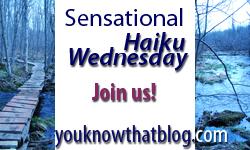 Thanks very much for your help in inspiring one of the haiku in my Out on a Limb Haiku Quintet. Love those A-ha moments!! And it goes so very well in your haiku!! Beautiful set of 3 haikus but the second one gets my applause!! Bravo!! That photo of the geranium is such mediterannean bliss. Great haiku- I do n0t know why I can’t post a comment to your post directly. nothing can compete those “a-ha” moments in elation, just like Nanka said- the reason may vary. loved all three of them. Lovely set Jenn – the first one particularly struck a chord for me. Oh the summer one gives me such a nice image – I really hope we have some nice summer this year. All three are wonderful but the last is perfect bliss indeed! Have a lovely day. Selling oneself short can certainly dash elation! Welcome aboard, Mysti – and congrats on your book! Time alone in peace is such bliss. I see you through green eyes too :D Love the new layout…I’m still contemplating going back to blogger – fixing up the site now. Lame, I know, but easily manageable!! I’ll get it together one of these days, Jenn! Soon Amoeba will be back on his teaching schedule and I can make a schedule, too! And on that day I will be elated! Sorry I missed this week again Jenn Mark was in the hospital with an infection, will be here next week!